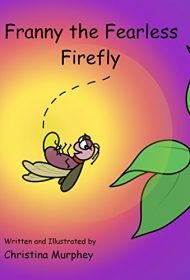 In Franny the Fearless Firefly, the daring title character learns the value of caution after a close encounter with a mason jar. Franny worries her loved ones with her daredevil antics, but she can’t resist them. Each time she takes reckless flight paths, her friends warn her that next time she’ll get snapped up by a bird or swallowed by a fish. No matter, their warnings don’t concern the young firefly, even after several near misses with various creatures. Then one day, Franny spots some children playing outside. She decides to zip through the clearing, only to have one of the children capture her in a glass jar. All alone and sealed in, Franny finally realizes she may have gone too far. Just as her fear sets in, her captor feels pity and releases her into the night air. Franny vows she’ll be more careful, even while having fun. The story features delightful characters, colorful illustrations and an engaging flow, with dramatic moments in all the right places. However, the author misguidedly uses alliteration throughout the text, perhaps as a teaching tool. The overuse of words starting with “f” (“Once Franny realized she was free, she feverishly flew for the forest”), makes the narrative feel overworked, especially since the alliteration doesn’t play a part in the plot or stem naturally from the setting. While Franny the Fearless Firefly would benefit from revision to eliminate the distracting alliteration, overall it brings relatable characters, charm—and a useful cautionary message—to the table.